By stayhomecupcake on November 29th, 2009 . Filed under: Crafts, Cupcake Ideas, Home Decor . 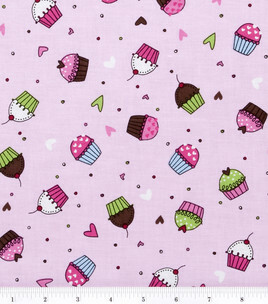 I went to Joanne’s Fabric and Crafts Store last week and was so pleased to find these two new adorable cupcake fabrics. Look for a 50% off coupon in the Sunday paper and get it for $3.50/yard. I bought a couple of yards but haven’t decided what I will make it into yet. Maybe a pillowcase for me or a skirt for my daughter? Click on the comment area below and tell me what you would do! I made aprons using cupcake fabric for the front and polka-dot fabric for the back/contrast. I made one for my daughter and one for her best friend. I also gave the best friend a kid’s cupcake cookbook for her birthday. It was a cute gift and best friend loved it! If I could sew, I would make a kitchen set. Placemats, dish towels, pot holders, window valance, etc. I want to decorate my kitchen with cupcakes, but can’t find ANYTHING!!! OH a caserole carrier would be so adorable if you could find a simple pattern to sew!! I am planning on finding this cute fabric at my local JoAnn’s. I would decopauge it onto a paper box and use it to hold stuff in the bathroom or craft area. 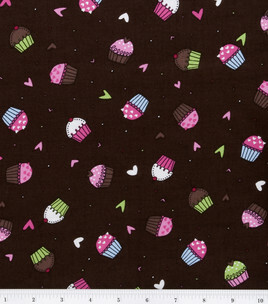 I would use the cupcake fabric to make an apron for one of my grandaugther, who loves to make and decorate cupcakes. I used both the brown and the pink cupcake fabric to make an apron (contrasting) and matching pot-holder. After showing it off to a work mate, she wants me to make a set for her……Problem, I found more of the brown but not the pink, it sold out fast at JoAnne’s…..any ideas?? I made mother/daughter aprons out of the pink w/cupcakes for my granddaughter’s birthday for her and my daughter-in-law. I appliqued a cupcake on each one on the front with their initals – they turned out so cute. I made a matching bib for baby sister (youngest grandddaughter). Now she is old enough to “help” in the kitchen and I want to make an apron for her as well using the same fabric. I made mother/daughter aprons out of the pink w/cupcakes for my granddaughter’s birthday for her and my daughter-in-law. I appliqued a cupcake on each one on the front with their initials – they turned out so cute. I made a matching bib for baby sister (youngest granddaughter). Now she is old enough to “help” in the kitchen and I want to make an apron for her as well using the same fabric.